JURGEN KLOPP REFUSED to answer a question posed by a journalist working for The Sun following Liverpool’s win against Barcelona on Saturday. It is as yet unclear whether the German manager’s decision is related to the tabloid paper’s controversial coverage of the 1989 Hillsborough disaster, which has since been widely condemned and which prompted the publication to issue a belated apology in 2012. 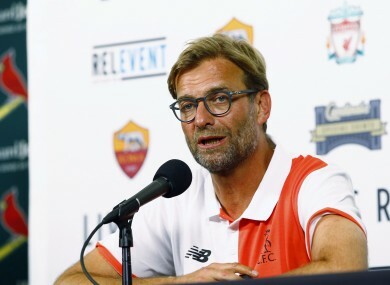 Speaking to the journalist in question at a press conference following the 4-0 defeat of Barca, Klopp said: “I don’t talk with The Sun anymore. I don’t speak with The Sun anymore. You can listen. “It’s not because I’m with Liverpool now. It’s because of a few things that will happen in the next few days or few weeks, I don’t know. Email “Jurgen Klopp refuses to answer question from The Sun journalist ”. Feedback on “Jurgen Klopp refuses to answer question from The Sun journalist ”.